Now that barbecue season has truly arrived here is my recipe for barbecue sauce. Everyone has their own taste when it comes to barbecue sauce, so I expect a lot of adjustments to occur. As for the recipe for the rub I used first on the chicken in the above photo that is staying a secret partly because I always make them to taste and can’t even guess on measurements. I like to use a dry rub on chicken, grill it and when almost done glaze it with barbecue sauce while it finishes cooking. A dry rub is basically a mixture of spices used to enhance the flavor of meat. Depending on the type of meat being cooked different spices can accomplish different flavors and complement other parts of the dish. For example with chicken I use a mix of dried chili peppers, hot pepper, brown sugar, salt, green peppercorn, rosemary, Old Bay seasoning, cardamon, dried garlic and nutmeg. Of course, this can vary depending on the final dish I am cooking and the type of meat. 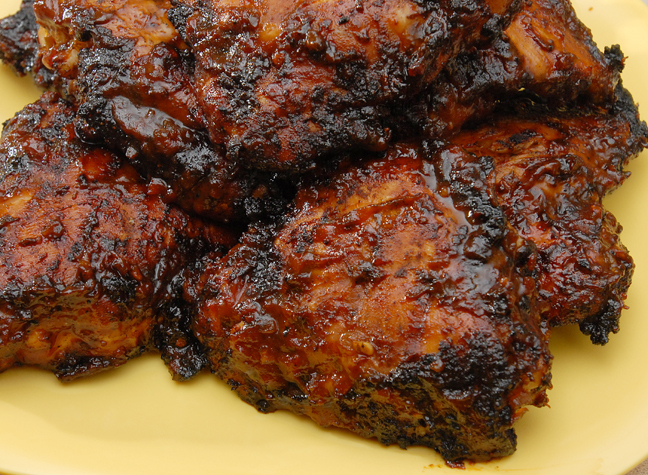 Thighs and legs work best for barbecue chicken because the bone keeps the meat tender while roasting over a fire. When using habenara pepper make sure to wash your hands very well and then still be very careful not to touch your fingers to any sensitive spots on your body for a couple hours. (Use a glove if need be.) Chop all the vegetables as tiny as possible. The sauce keeps in the refrigerator for at least a month in a well sealed container. In a large stock pot heat 2 tbsp oil over medium heat and saute onion until translucent. Add green pepper and jalepeno and continue to cook until onion begins to brown. Add habenara and garlic and cook for two minutes. Season with salt and pepper then add all other ingredients. Bring to a boil then turn heat down to low and simmer for ten minutes. Let sauce cool. This entry was posted in Food, Recipes, Sides and tagged barbecue, sauce. Bookmark the permalink. ok, now i’m drooling… interesting to see molasses as an ingredient here. is that typical of southern-style bbq? I really don’t think there is a typical southern style bbq but molasses does pop up from time to time. Rufus, Rufus, Rufus. Of course there is a southern style bbq. My father was a master. And you could break it down even further; Texas, Louisiana, Kansas(I don’t think that’s the south), Alabama, Virginia etc. I’ve tasted each of these and also “northern style” bbq; no contest. Ask Dave. I love the ingredients in your rub. I bet that would work well for pork also. The reason I said there isn’t a typical style is because every state has it’s own variation and there are many variations within. What you get in the Carolinas is way different than St. Louis or Dallas. We’ve lived in Arkansas for the last six years. There’s a place down here that has a six-pack on the table, mustard, vinegar, molasses, honey, super spicy, mild. So fun to mix and match. I think a lot of places do that. Rosemary, what’s your favorite style? Yep, Texas does BBQ right. I do the slow cooking thing with ribs and pulled pork and brisket. I’ll post later this summer and you can say, nice but that ain’t my dad’s. And I’ll understand. I bet your dad made some amazing creole food too. I love a good homemade barbecue sauce, especially one that you can make and keep to use for a couple of braais (barbecues). Think I may have to reduce the peppers a little with this recipe though – my heat threshold is only about a 5 out of 10.
you’ve just answered a question for me – what to give my guests at the weekend. I am determined we will grill and this sounds just amazing to spice up what will probably be a wet day! Is Habanera dried chilli? I guess any dried hot chilli will substitute? Can’t wait to get mixing, I’m going to make lots so it keeps. Thank you! Yes, if you don’t have habaneras that’s fine. You’ll probably make other adjustments to taste as you go along. Part of the fun is the tweaking. Making this type of dish from scratch always yields the best results. Thank you for pointing out that barbeque doesn’t have to come from a bottle! Wonderful. I have a huge bag of various types of my dried chillies from last summer that I am using up, so these will come in very handy. To be honest, the sauce sounds so delicious I think I could just eat it out of a bowl without the meat. But that´s a bit gross isn´t it?! Really spectacular save and that chicken looks incredible! Ha, I’ve made some saves in the kitchen too. :) And thanks. that was suppose to say sauce not save! Now that’s a sauce you can sink your teeth into. I’m always on the look-out for a good barbecue sauce and, thanks to you, I think I have one now. First of all…O-M-G…it’s only 8:15 in the morning and I want that chicken…we are taking a trip to see my family in July and will be cooking out a lot…I just may have to whip these bad boys up! I think your style may be my favorite style. Your chicken looks incredible! I appreciate the detailed directions like using your dry rub alone while grilling until the last few minutes when you baste with the sauce. I love to grill…have to fight my hubby for the tongs…so I like to “one up him” with my grilling knowledge! TY! Geni…have you ever watched the guy who does the grilling show on Saturdays on PBS?? If you haven’t, you should, it’s great! How did you know I was talking about bbq chicken last night? I haven’t had it in a long time and I used to request it as my birthday meal every year as a kid. Your sauce sounds amazing. I’ve never made a bbq sauce before but I’m a big fan of sauce making. Maybe I’ll put this on my b-day menu this year. I’m just about to put together my menus for the weekend and next week; this is now on the list. We’re supposed to have good weather this weekend so grilling outside is finally an option (it has pretty much rained non-stop here all spring)! By the way, when I was a kid (growing up in Texas), my dad and grandpa both used the big barbecues made out of oil drums with smoke stacks. When we moved to Ohio and put it in our backyard, none of the neighbors could figure out what it was. Ha! What would you recommend for substituting out the cider vinegar? You know, in the hypothetical situation that some weirdo was allergic to apples. You can use white vinegar. Just use some Georgia peaches in the sangria too! Looks like you stumbled into the great religious barbecue debate. I lived in NC for a while and got a bit partial to their vinegar based pulled pork barbecue but all the traditions are pretty darn good. That’s one of the best looking bbq sauces I’ve ever seen. Our grilling season is very short in Canada and we have a lot to learn from our American counterparts in this area. I too like glazing in the final minutes of grilling – I find it minimizes charring and locks in flavour. Yum! Thanks for this post. This sauce sounds wonderful and that meat looks great. Now, I am really hungry. Sangria is my favorite drink, too. I must try this. Have a wonderful holiday weekend. I bet you make a mean sauce too. Have a great weekend! OLD BAY! Be still my beating heart. I really want to grill this weekend, I should try out your dry-rub method (normally we’re marinade people around here). Best spice mix in the world! This looks great! I have to get my head into grilling season! That barbecue looks absolutely scrumptious! I am with you, thighs and legs are the way to go with chicken. This sauce has it all – sweet & spicy! Yum….sounds great. I am so in the mood for some BBQ this weekend. May have to give this a try. Sounds and looks delicious. Now I am hungry for ribs. Yum! I will have to give your white Sangria a try. I am a big fan of (Bare Foot) moscato. That ingredient list is impressive! I will pass this recipe to my dad and uncles who love BBQ sauce. Happy Friday! Will have to try this! My family didn’t eat BBQ hardly at all, our idea of homemade sauce was my grandmother mixing ketchup, brown sugar, spicy mustard. This sounds so much more appetizing. You have every ingredient I would wish for in a barbecue sauce in this recipe. Can’t wait to try it! That chicken looks amazing. I love that you make your bbq sauce by hand instead of going with a plastic bottled store-bought sauce. Thanks, once a coworker house sat for use and left store-bought BBQ. My wife put it in a brown paper bag and took it back to them. Old Bay! Ha ha…showing your Maryland roots! There’s clearly a legion of Old Bay fans, but I’m linking to it now because it confused some people from outside the East Coast the last time I mentioned it. I’m so happy you posted this. I hate buying the bottled stuff because there’s always something not quite right about it…too sweet, too salty, too spicy, not spicy enough… So I’ll be trying your recipe soon! I’m looking forward to having a good recipe to play around with! That image wants me to lick my finger. So long have I wanted a great BBQ sauce recipe that doesn’t contain a pre-made sauce (ketchup)! Great job, my friend, I look forward to trying this. Looks wonderful (and this from a Western Kentucky native … where BBQ is religion)! Why thanks, the compliment means that much more! Not too much better in this world than BBQ chicken on the grill. Sauce looks to die for!